The Dukan Diet is internationally recognized for its success in helping people around the world lose weight and keep it off. Through books, online diet coaching and the sale of quality food products and supplements, the Dukan Diet has become the fastest growing international diet method. 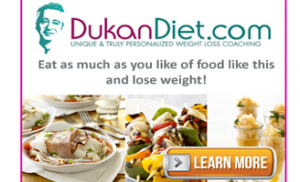 The Dukan Diet is a diet based in biological and psychological sciences. It uses the appetite suppressing powers of proteins and four carefully planned phases to not only help you lose weight, but to help you keep it off permanently. The system is simple, but effective and well-supported, making it easier to follow. For those who have tried other diets and not been able to keep off their weight- a common phenomenon- the Dukan Diet is a great diet to try, as it actually has a specific plan for the long term after you have lost the desired weight. The basic principle of the Dukan Diet is familiar to many dieters- it is a low fat, low carb, high protein diet. In the first stage, “Attack”, you switch to a fully protein diet. There are still a lot of choices here, but it is important to switch to full protein to tell both your body and your mind you are starting the diet. This also takes advantage of the ability of proteins to suppress appetite. The second stage, “Cruise,” adds vegetables to the diet. This allows you more variety of flavor and also ensures you are able to get more essential nutrients. This stage encourages gradual, healthy weight loss. In the third stage, “Consolidation,” you are allowed to gradually add other foods back into your diet. The final stage, “Permanent Stabilization,” is the most important. This is what helps you keep the weight off. Rather than letting you go fully back to your old eating habits, the final stage has a few rules to keep you active and eating more protein than you otherwise might, so you can stay at the weight you arrived at through the other stages. The main pro of this diet is the last two phases. Many diets have extreme food limitations and expect dieters to continue within those restrictions. If they stop following the extreme parts of the diet, they gain the weight back. However, the Dukan Diet makes a plan for the long term by reintroducing other types of food after the weight loss stage, but doing it slowly and after all of the loss has been achieved and the protein has had plenty of time to boost the dieter’s metabolism and reduce their appetite. By explicitly continuing into a ‘rest of your life’ stage with a few simple rules that still allow you to largely eat what you want, the Dukan Diet makes itself sustainable in a way that few other diets do. Another pro of the Dukan Diet is the great support it has. The founding doctor has weekly Q & A sessions on the site, and there is a cookbook on the site with recipes that fit the first two stages of the diet. With a solid community and lots of ideas and answers, it is much easier to stay on a diet. The main potential con of the Dukan Diet is that for some people, if they were to go back fully to their old eating and exercising habits with the exception of the three rules in the final stage, they probably still would gain some weight back. The idea is that one’s appetite will be suppressed by the protein and that the first two stages will have encouraged healthier eating habits, especially if the dieter tries a variety of recipes based around protein and vegetables. I suspect this is usually the case, and if it is, then the dieter should have no problem keeping the weight off, but if not, it could be a problem. All in all, the Dukan Diet seems to be successful not only because of its basis in scientific knowledge of proteins, but because of its understanding that people need support and encouragement to continue diets and that very few people will be able to permanently sustain extreme changes to their eating habits. By creating a plan for weight maintenance, the Dukan Diet shows a great deal of foresight and helps its followers lose weight permanently in a way that few other diets do.